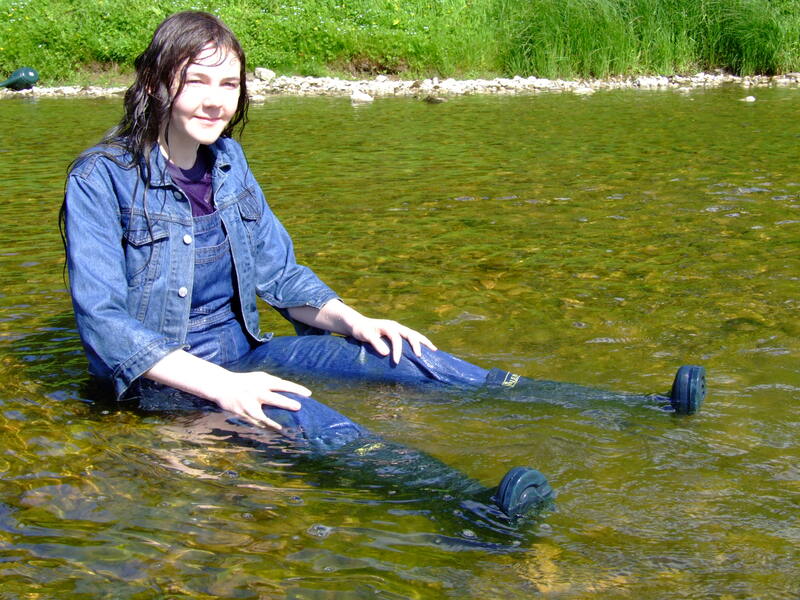 Dungarees in the Shallows - Chastity's working rig gets a drenching! Traditions and rituals are important in Yorkshire. When she first came to the Hall, Chastity the head gardener symbolically 'married' herself to the land and the waters, taking a deep dip in the river in a beautiful white bridal gown. Now, as she prepares to commence her duties fully about the gardens of the estate, she completes the process, donning her favourite practical working rig of wellies, dungarees, t-shirt, and denim jacket, and wading out into the shallows of the river to be drenched by watering can, enjoying the feel of the water slowly engulfing and soaking her. Once she's completely drenched, she lies down in the water, changing position as she becomes one with the beautiful ancient landscape of the Dales.